Have you seen those recipes where they take a boxed mix, like a cake mix, add a few special ingredients and all the sudden it's gourmet! Those things are perfect for me because I seriously cannot cook or bake. Even my Kraft Mac n' Cheese doesn't always turn out right. Today's mani is based on the same principle - taking something boxed and making it gourmet. This look was done with Sally Hansen Salon Effects Nail Polish Strips in Snake Charmer with half moons painted on top in Essie Licorice and Beyond Cozy. I told my husband I freehanded the snakeskin pattern. Silly husband...he believed me! I always pick up Sally Hansen strips if I see them in the clearance bin. Even if I'm not crazy about a design...they make a good base for nail art. I applied the strips to a clean nail, then used a small brush to freehand a larger half-moon in Licorice, then a smaller half moon in Beyond Cozy. 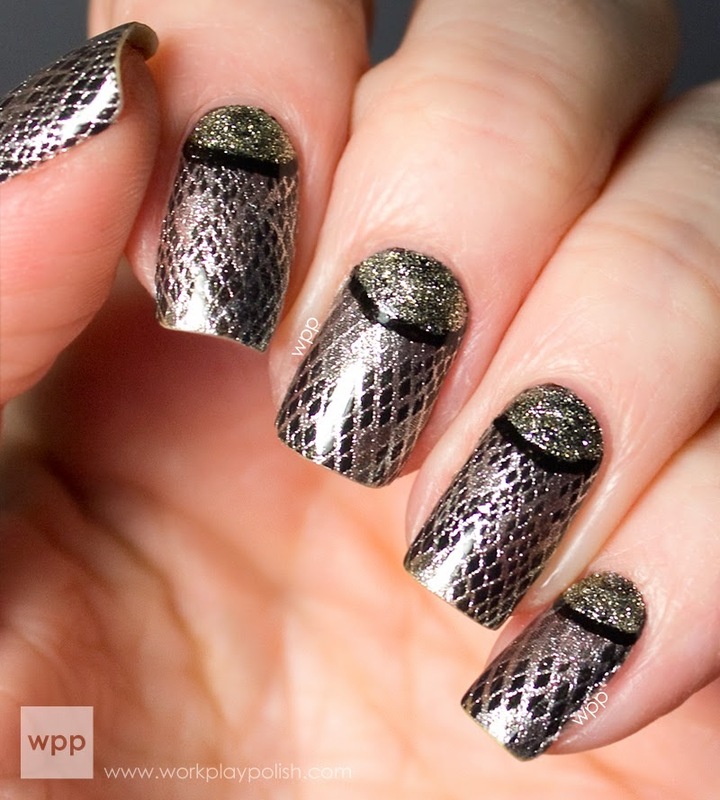 The snake skin is so busy that it didn't have to be perfect to look right. This look was so easy, but it looked really difficult to execute in real life. Did you see the other Digit-al Dozen animal manis yesterday? Pretty awesome, as usual. Click the link to check out today's art.